If this area wasn’t the birthplace of human civilization, it was at least a birthplace of human civilization. 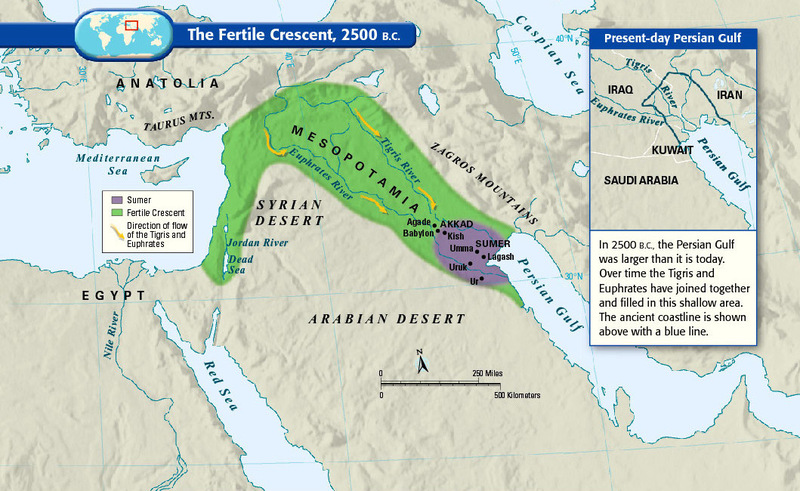 Called «the fertile crescent» because of its lush soil, the «crescent» of land mostly includes modern-day Iraq, Syria, Jordan, and Israel-Palestine. (Some definitions also include the Nile River valley in Egypt.) People started farming here in 9000 BC, and by around 2500 BC the Sumerians formed the first complex society that resembles what we’d now call a «country,» complete with written laws and a political system. Put differently, there are more years between Sumerians and ancient Romans than there are between ancient Romans and us. The Phoenicians, who lived in present-day Lebanon and coastal Syria, were pretty awesome. From about 1500 to 300 BC, they ran some of the Mediterranean’s first big trading networks, shown in red, and dominated the sea along with the Greeks, who are shown in brown. Some sailed as far as the British Isles, and many of them set up colonies in North Africa, Spain, Sicily, and Sardinia. This was one of the first of many close cultural links between the Middle East and North Africa – and why Libya’s capital, Tripoli, still bears the name of the ancient Phoenician colony that established it. The Middle East actually gave Europe religion four times, including Islam, but this map shows the first three. First was Judaism, which spread through natural immigration and when Romans forcibly dispersed the rebelling Israelites in the first and second century AD. In the first through third centuries A.D., a religion called Mithraism — sometimes called a «mystery religion» for its emphasis on secret rites and clandestine worship — spread from present-day Turkey or Armenia throughout the Roman Empire (at the time, most adherents believed it was from Persians in modern-day Iran, but this is probably wrong). 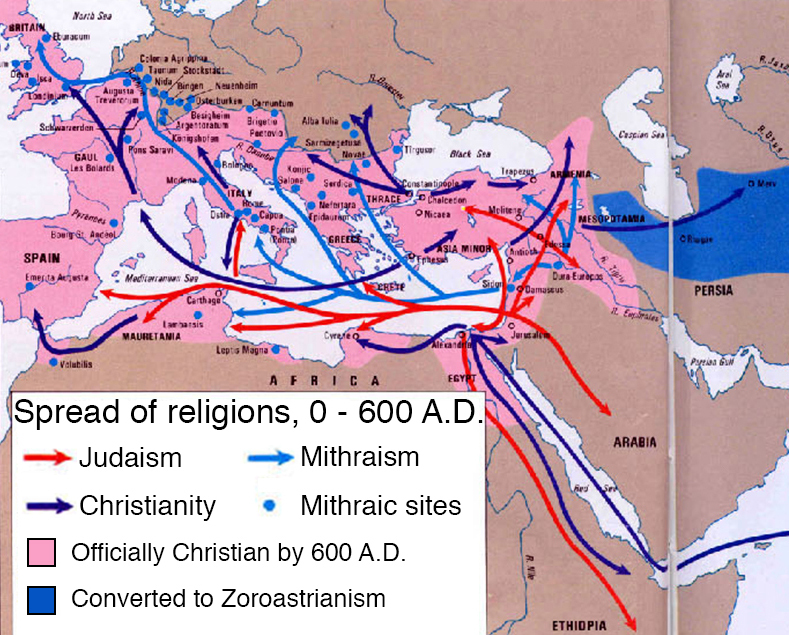 Mithraism was completely replaced with Christianity, which became the Roman Empire’s official religion, after a few centuries. It’s easy to forget that, for centuries, Christianity was predominantly a religion of Middle Easterners, who in turn converted Europeans. In the early 7th century AD in present-day Saudi Arabia, the Prophet Mohammed founded Islam, which his followers considered a community as well as a religion. As they spread across the Arabian peninsula, they became an empire, which expanded just as the neighboring Persian and Byzantine Empires were ready to collapse. In an astonishingly short time — from Mohammed’s death in 632 to 652 AD — they managed to conquer the entire Middle East, North Africa, Persia, and parts of southern Europe. They spread Islam, the Arabic language, and the idea of a shared Middle Eastern identity — all of which still define the region today. It would be as if everyone in Europe still spoke Roman Latin and considered themselves ethnically Roman. 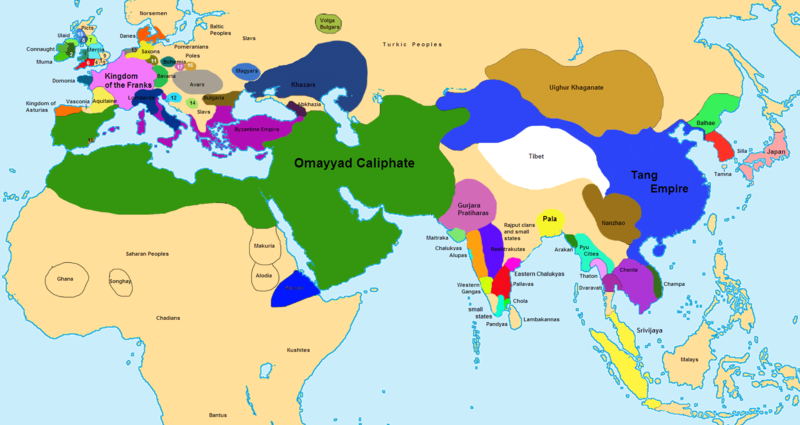 This is a rough political map of the world in 750 AD, at the height of the Omayyad Caliphate («caliph» means the ruler of the global Islamic community). This is to give you a sense of how vast and powerful the Muslim empire had become, barely one century after the founding of the religion that propelled its expansion. It was a center of wealth, arts, and learning at a time when only China was so rich and powerful. This was the height of Arab power. The Ottoman Empire is named for Osman, its first ruler, who in the early 1300s expanded it from a tiny part of northwest Turkey to a slightly less tiny part. It continued expanding for about 500 years — longer than the entire history of the Roman Empire — ruling over most of the Middle East, North Africa, and southeastern Europe for centuries. The empire, officially an Islamic state, spread the religion in southeast Europe but was generally tolerant of other religious groups. It was probably the last great non-European empire until it began declining in the mid-1800s, collapsed after World War I, and had its former territory in the Middle East divided up by Western Europe. This is a pivotal year, during the Middle East’s gradual transfer from 500 years of Ottoman rule to 50 to 100 years of European rule. Western Europe was getting richer and more powerful as it carved up Africa, including the Arab states of North Africa, into colonial possessions. 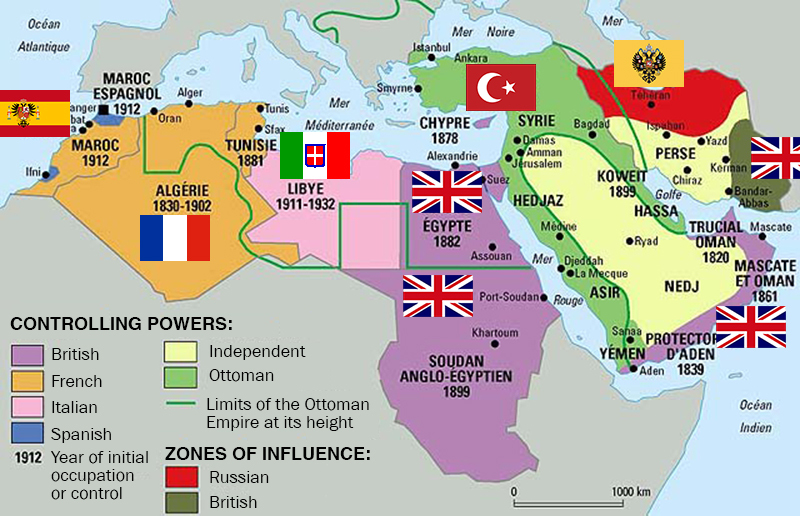 Virtually the entire region was ruled outright by Europeans or Ottomans, save some parts of Iran and the Arabian peninsula divided into European «zones of influence.» When World War I ended a few years later, the rest of the defeated Ottoman Empire would be carved up among the Europeans. The lines between French, Italian, Spanish, and British rule are crucial for understanding the region today – not just because they ruled differently and imposed different policies, but because the boundaries between European empires later became the official borders of independence, whether they made sense or not. You hear a lot today about this treaty, in which the UK and French (and Russian) Empires secretly agreed to divide up the Ottoman Empire’s last MidEastern regions among themselves. 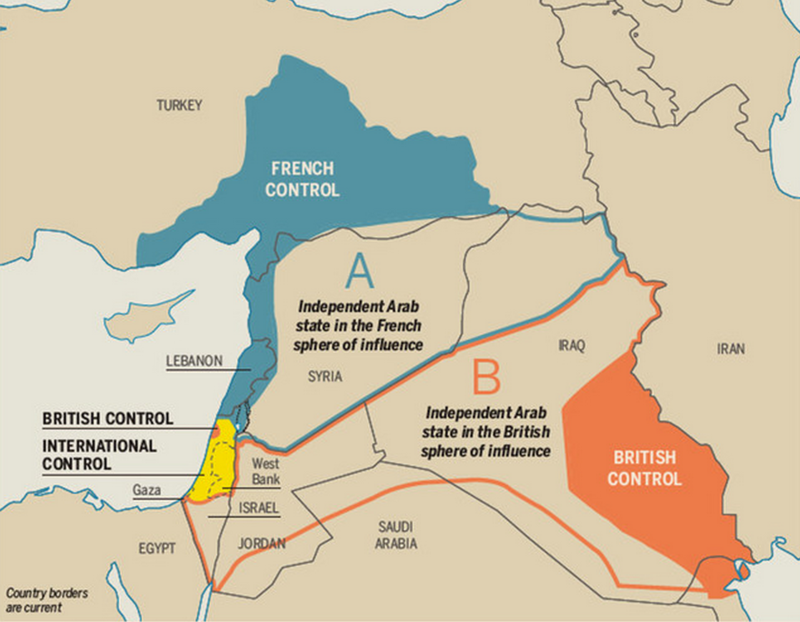 Crucially, the borders between the French and British «zones» later became the borders between Iraq, Syria, and Jordan. Because those later-independent states had largely arbitrary borders that forced disparate ethnic and religious groups together, and because those groups are still in terrible conflict with one another, Sykes-Picot is often cited as a cause of warfare and violence and extremism in the Middle East. But scholars are still debating this theory, which may be too simple to be true. You may have noticed a theme of the last eight maps: empires, mostly from outside the Middle East but sometimes of it, conquering the region in ways that dramatically changed it. This animation shows you every major empire in the Middle East over the last 5,000 years. To be clear, it is not exhaustive, and in case it wasn’t obvious, the expanding-circle animations do not actually reflect the speed or progression of imperial expansions. But it’s a nice primer. This time-lapse map by Michael Izady — a wonderful historian and cartographer at Columbia University, whosefull collection can be found here — shows the political boundaries of the greater Middle East from 1450 through today. You’ll notice that, for much of the last 500 years, most or all of the region has been under some combination of Turkish, Persian, and European control. For so much of the Arab Middle East to be under self-rule is relatively new. Two big exceptions that you can see on this map are Morocco and Egypt, which have spent more of the last 500 years as self-ruling empires than other Arab states. That’s part of why these two countries have sometimes seen themselves as a degree apart from the rest of the Arab world. It is still amazing, looking back at early and mid-2011, how dramatically and quickly the Arab Spring uprisings challenged and in many cases toppled the brittle old dictatorships of the Middle East. What’s depressing is how little the movements have advanced beyond those first months. Syria’s civil war is still going. Egypt’s fling with democracy appeared to end with a military coup in mid-2013. Yemen is still mired in slow-boil violence and political instability. The war in Libya toppled Moammar Qaddafi, with US and European support, but left the country without basic security or a functioning government. Only Tunisia seems to have come out even tenuously in the direction of democracy. 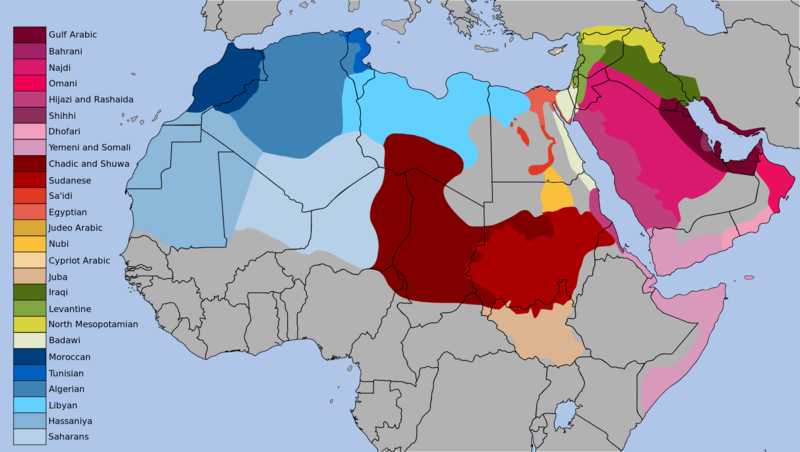 This map shows the vast extent of the Arabic-speaking world and the linguistic diversity within it. Both go back to the Caliphates of the sixth and seventh century, which spread Arabic from its birthplace on the Arabian Peninsula across Africa and the Middle East. Over the last 1,300 years the language’s many speakers have diverged into distinct, sometimes very different, dialects. Something to look at here: where the dialects do and do not line up with present-day political borders. In places where they don’t line up, you’re seeing national borders that are less likely to line up with actual communities, and in some cases more likely to create problems. The story of Islam’s division between Sunni and Shia started with the Prophet Mohammed’s death in 632. There was a power struggle over who would succeed him in ruling the Islamic Caliphate, with most Muslims wanting to elect the next leader but some arguing that power should go by divine birthright to Mohammed’s son-in-law, Ali. That pro-Ali faction was known as the «Partisans of Ali,» or «Shi’atu Ali» in Arabic, hence «Shia.» Ali’s eventual ascension to the throne sparked a civil war, which he and his partisans lost. The Shia held on to the idea that Ali was the rightful successor, and grew into an entirely separate branch of Islam. Today about 10 to 15 percent of Muslims worldwide are Shia — they are the majority group in Iran and Iraq only — while most Muslims are Sunni. «Sunni» roughly means «tradition.» Today, that religious division is again a political one as well: it’s a struggle for regional influence between Shia political powers, led by Iran, versus Sunni political powers, led by Saudi Arabia. This struggle looks an awful lot like a regional cold war, with proxy battles in Syria and elsewhere. 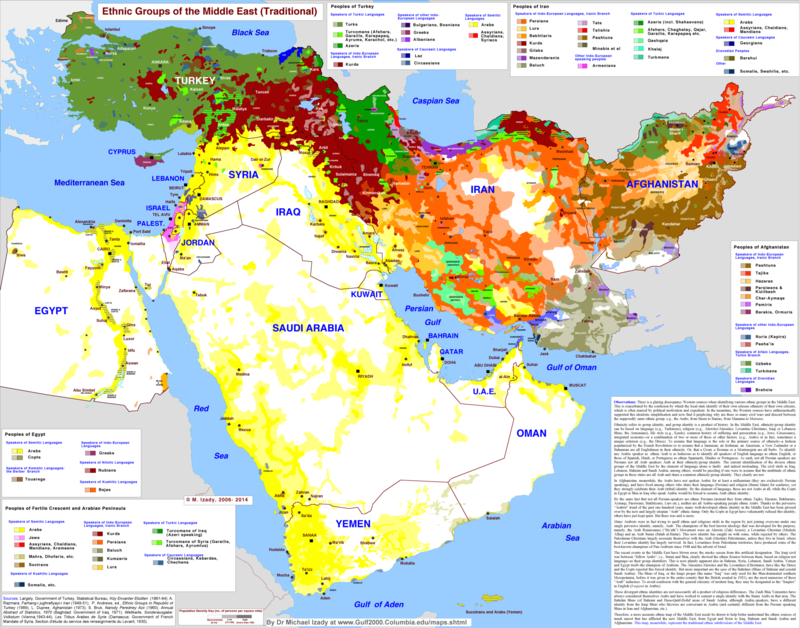 The most important color on this map of Middle Eastern ethnic groups is yellow: Arabs, who are the majority group in almost every MidEast country, including the North African countries not shown here. The exceptions are mostly-Jewish Israel in pink, mostly-Turkish Turkey in green, mostly-Persian Iran in orange, and heavily diverse Afghanistan. (More on the rich diversity of Iran and Afghanistan below.) That splash of red in the middle is really important: ethnic Kurds, who have no country of their own but big communities in Iran, Iraq, Syria, and Turkey. But the big lesson of this map is that there is a belt of remarkable ethnic diversity from Turkey to Afghanistan, but that much of the rest of the region is dominated by ethnic Arabs. This map makes a point about what the Middle East is not: it is not synonymous with the Islamic world. This weighted population map shows every country in the world by the size of its Muslim population. Countries with more Muslim citizens are larger; countries with fewer Muslim citizens are smaller. You’ll notice right away that the Middle East makes up just a fraction of the world’s total Muslim population. There are far more Muslims, in fact, in the South Asian countries of India, Pakistan, and Bangladesh. The biggest Muslim population by far is Indonesia’s, in southeast Asia. And there are millions in sub-Saharan Africa as well. The Islamic world may have begun in the Middle East, but it’s now much, much larger than that. 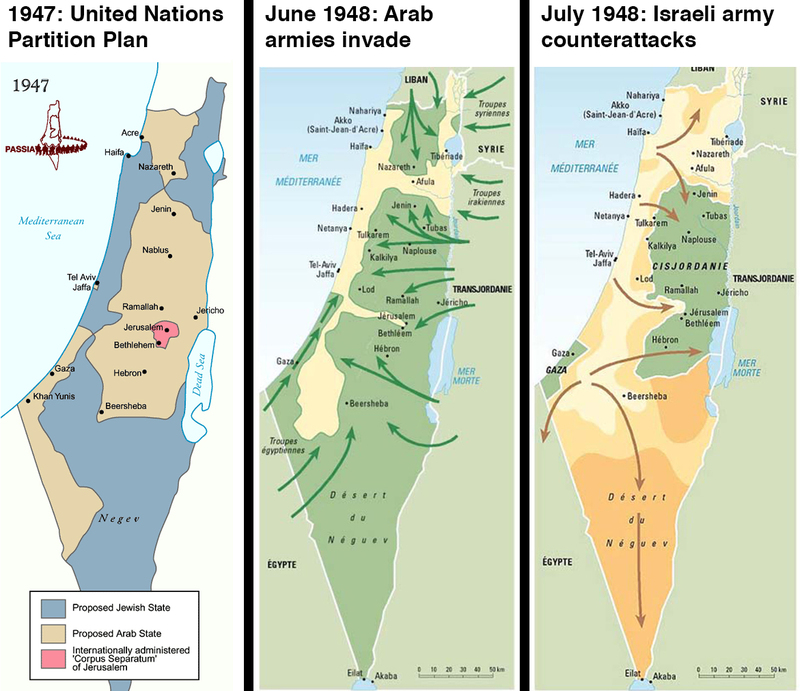 These three maps show how Israel went from not existing to, in 1947 and 1948, establishing its national borders. It’s hard to identify a single clearest start point to the Israel-Palestine conflict, but the map on the left might be it: these are the borders that the United Nations demarcated in 1947 for a Jewish state and an Arab state, in what had been British-controlled territory. The Palestinians fought the deal, and in 1948 the Arab states of Egypt, Jordan, Iraq, and Syria invaded. The middle map shows, in green, how far they pushed back the Jewish armies. The right-hand map shows how the war ended: with an Israeli counterattack that pushed into the orange territory, and with Israel claiming that as its new national borders. The green is what was left for Palestinians. 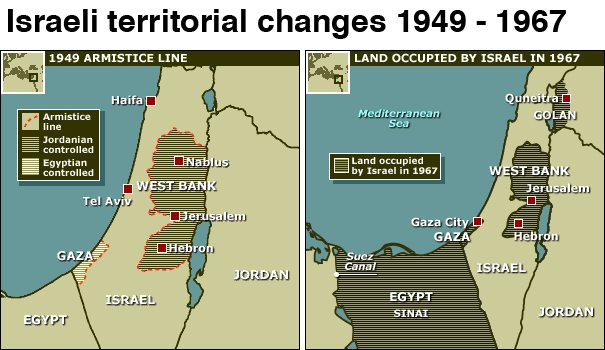 These three maps (click the expand icon to see the third) show how those 1948 borders became what they are today. The map on left shows the Palestinian territories of Gaza, which was under Egyptian control, and the West Bank, under Jordanian control. In 1967, Israel fought a war with Egypt, Jordan, and Syria. The war ended with Israel occupying both of the Palestinian territories, plus the Golan Heights in Syria and Egypt’s Sinai peninsula: that’s shown in the right map. Israel gave Sinai back as part of a 1979 peace deal, but it still occupies those other territories. 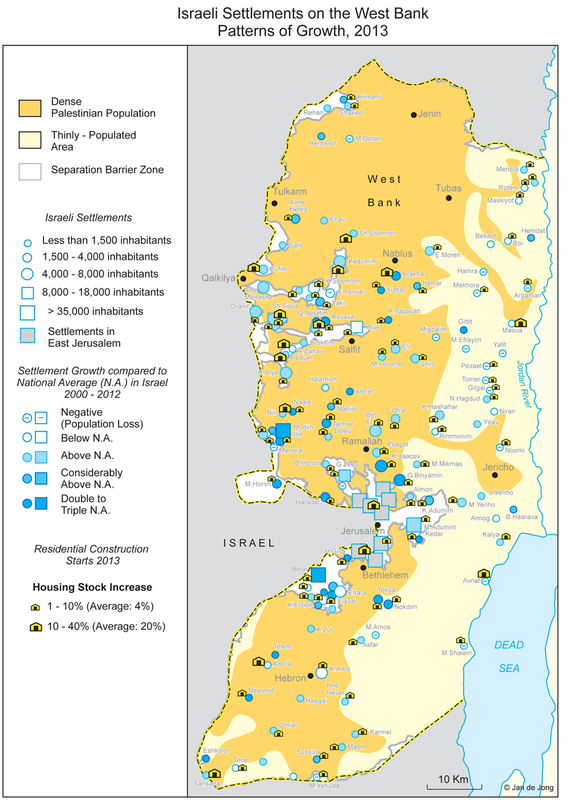 Gaza is today under Israeli blockade, while the West Bank is increasingly filling with Israeli settlers. The third map shows how the West Bank has been divided into areas of full Palestinian control (green), joint Israeli-Palestinian control (light green), and full Israeli control (dark green). 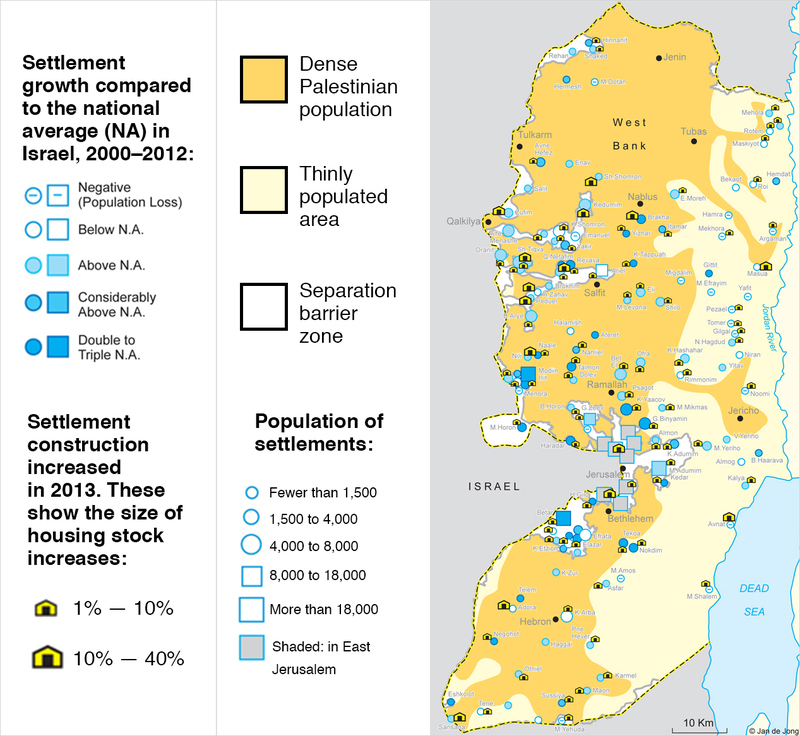 Since 1967, Israelis have been moving into settlements in the West Bank. Some go for religious reasons, some because they want to claim Palestinian land for Israel, and some just because they get cheap housing from subsidies. There about 500,000 settlers in 130 communities, which you can see in this map. The settlements make peace harder, which is sometimes the point: for Palestinians to have a state, the settlers will either to have to be removed en masse, or Palestinians would have to give up some of their land. The settlements also make life harder for Palestinians today, dividing communities and imposing onerous Israeli security. This is why the US and the rest of the world opposes Israeli settlements. But Israel is continuing to expand them anyway. This map shows a moment in the 2006 war between Israel and Lebanon. It also shows the way that war between Israel and its enemies has changed: Israel now has the dominant military, but the fights are asymmetrical. Israel wasn’t fighting a state, but the Lebanese militant group Hezbollah. It launched many air and artillery strikes in Lebanon (shown in blue) to weaken Hezbollah, destroying much of the country’s infrastructure in the process. Israel also blockaded Lebanese waters. Hezbollah fought a guerrilla campaign against the Israeli invasion force and launched many missiles into Israeli communities. The people most hurt were regular Lebanese and Israelis, hundreds of thousands of whom were displaced by the fighting. The Israel-Palestine conflict is a global issue, and as this map shows it’s got a global divide. Many countries, shown in green, still do not recognize Israel as a legitimate state. Those countries are typically Muslim-majority (that includes Malaysia and Indonesia, way over in southeast Asia). Meanwhile, the blue countries of the West (plus a few others) do not recognize Palestine as a country. They still have diplomatic relations with Palestine, but in their view it will not achieve the status of a country until the conflict is formally resolved. It is not a coincidence that there has historically been some conflict between the blue and green countries. 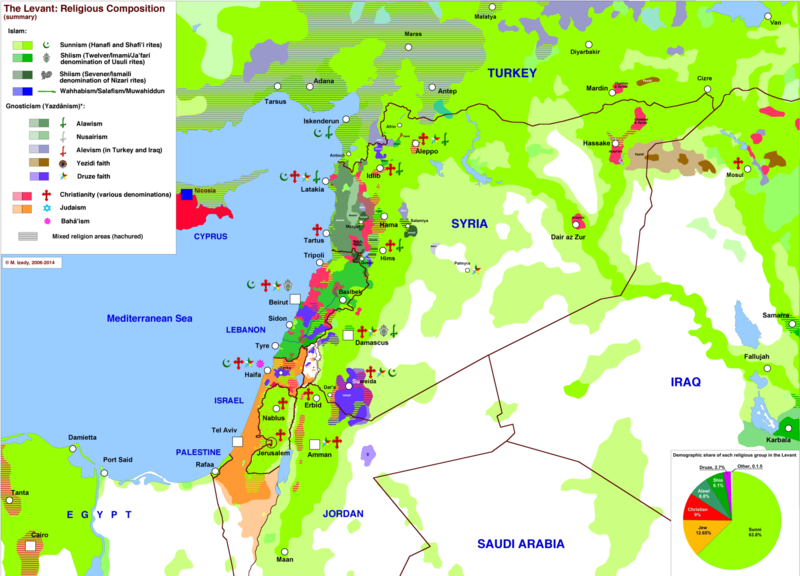 Each color here shows a different religious group in the part of the eastern Mediterranean called the Levant. It should probably not be surprising that the birthplace of Judaism and Christianity is religiously diverse, but this map drives home just how diverse. Israel stands out for its Jewish majority, of course, but this is also a reminder of its Muslim and other minorities, as well as of the Christian communities in Israel and the West Bank. Lebanon is divided among large communities of Sunnis, Shias, Christians, and a faith known as Druze — they’re at peace now, but the country’s horrific civil war from 1975 to 1990 divided them. There may be a similar effect happening in Syria, which is majority Sunni Muslim but has large minorities of Christians, Druze, Shia, and a Shia sect known as Alawites whose members include Syrian leader Bashar al-Assad and much of his government. This map shows the state of play in Syria’s civil war, which after three years of fighting has divided between government forces, the anti-government rebels who began as pro-democracy protestors, and the Islamist extremist fighters who have been moving in over the last two years. You may notice some overlap between this map and the previous: the areas under government control (in red) tend to overlap with where the minorities live. The minorities tend to be linked to the regime, whereas the rebels are mostly from the Sunni Muslim majority. 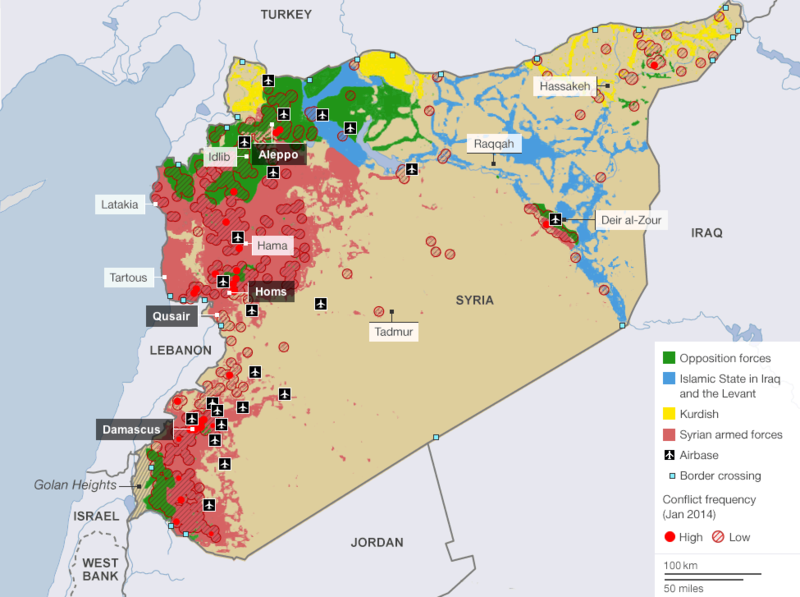 But the anti-government Syrian rebels (in green) have been taking lots of territory. Syria’s ethnic Kurdish minority also has militias that have taken over territory where the Kurds live. Over the past year, though, there’s been a fourth rising faction: Islamic State of Iraq and the Levant (sometimes called ISIS, shown in blue), an extremist group based in Iraq that swears allegiance to al-Qaeda. They’re fighting both the rebels and the government. So it’s a three-way war now, as if it weren’t already intractable enough. Syria’s civil war hasn’t just been a national catastrophe for Syria, but for neighboring countries as well. The war has displaced millions of Syrians into the rest of the Middle East and into parts of Europe, where they live in vast refugee camps that are major drains on already-scarce national resources. 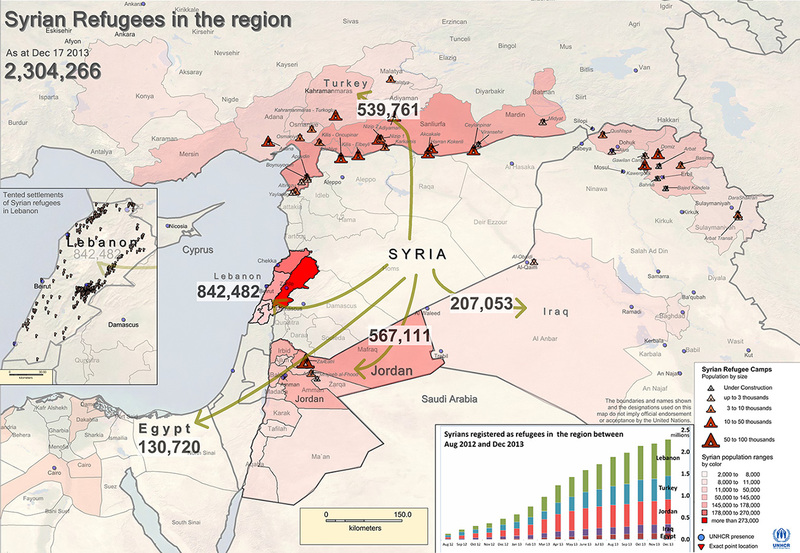 This map shows the refugees; it does not show the additional 6.5 million Syrians displaced within Syria. Their impact is especially felt in Jordan and Lebanon, which already have large Palestinian refugee populations; as many as one in five people in those countries is a refugee. While the US and other countries have committed some aid for refugees, the United Nations says it’s not nearly enough to provide them with basic essentials. 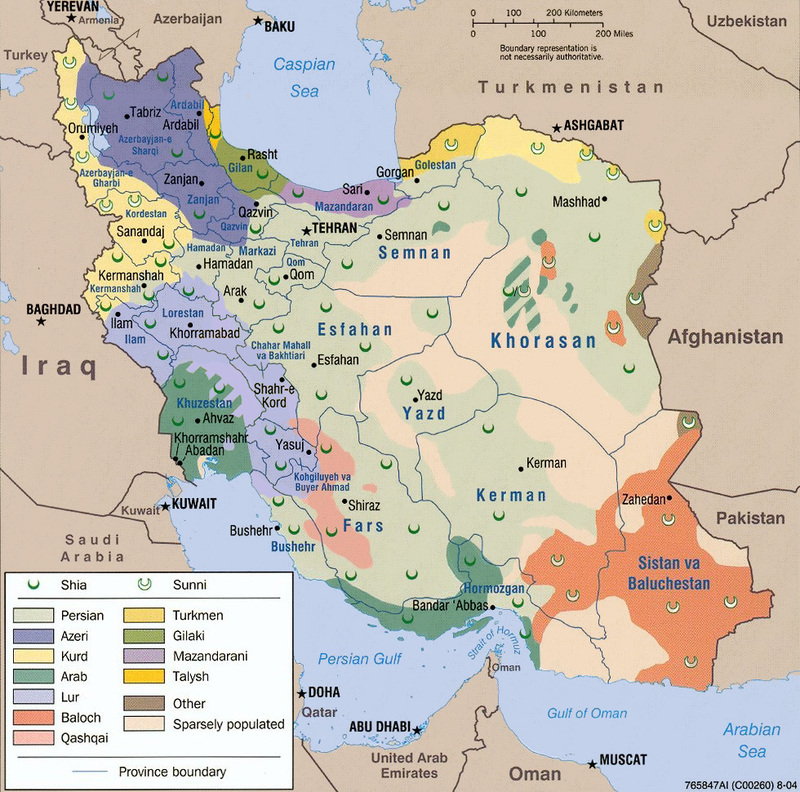 Iran is the only Middle Eastern country was never conquered by a European power, but it came pretty close in the 1900s. It lost a lot of territory to Russia (the red stripey part). 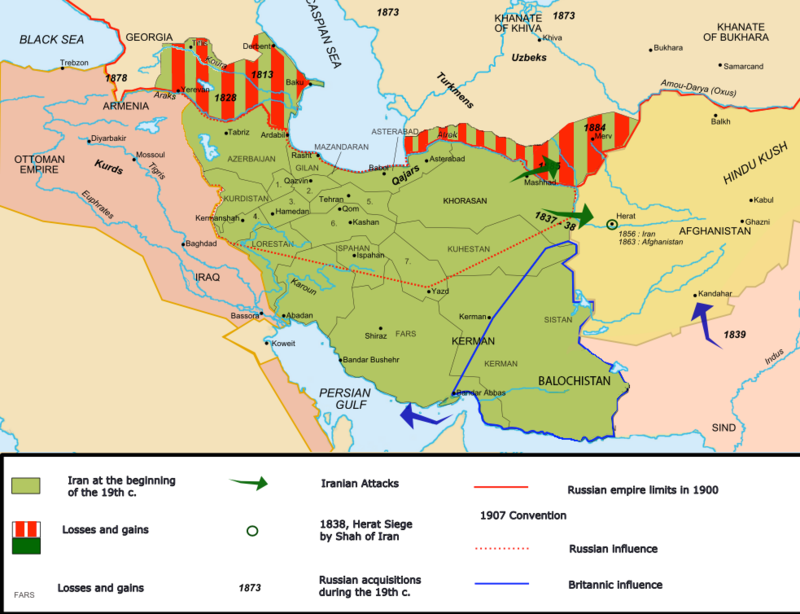 After that, the Russian Empire and British Empire (the British Indian Raj was just next door) divided Iran’s north and south into «zones of influence.» They weren’t under direct control, but the Iranian government was bullied and its economy and resources exploited. This remains a point of major national resentment in Iran today. Iran is most associated with the Persians — the largest ethnic group and the progenitors of the ancient Persian empires — but it’s much more diverse than that. This map shows the larger minorities, which includes Arabs in the south, Kurds in the west, and Azeris in the north (Iran used to control all Azeri territory, but much of now belongs to the Azeri-majority country Azerbaijan). The Baloch, in the southeast, are also a large minority group in Pakistan. There is significant unrest and government oppression in the «Baluchistan» region of both countries. This is a glimpse at two of the big, overlapping geopolitical issues in which Iran is currently embroiled. The first is Iran’s nuclear program: the country’s leaders say the program is peaceful, but basically no one believes them, and the world is heavily sanctioning Iran’s economy to try to convince them to halt the nuclear development that sure looks like it’s heading for an illegal weapons program. You can see the nuclear development sites on here: some are deep underground, while others were kept secret for years. 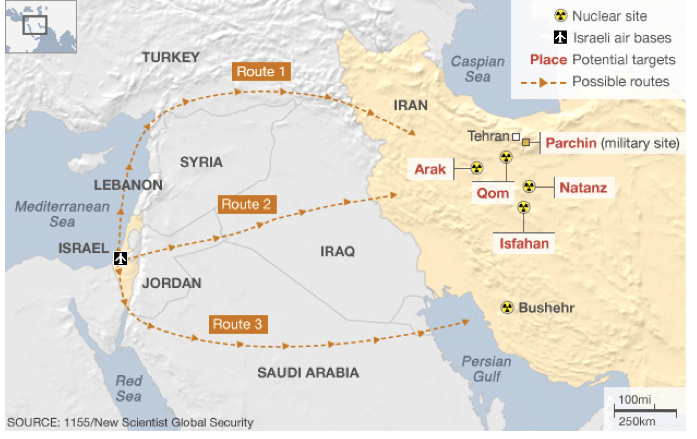 That gets to the other thing on this map, which was originally built to show how Israel could hypothetically launch strikes against Iran’s nuclear program. Israel-Iran tensions, which have edged near war in recent years, are one of the biggest and most potentially dangerous things happening right now in a part of the world that has plenty of danger already. 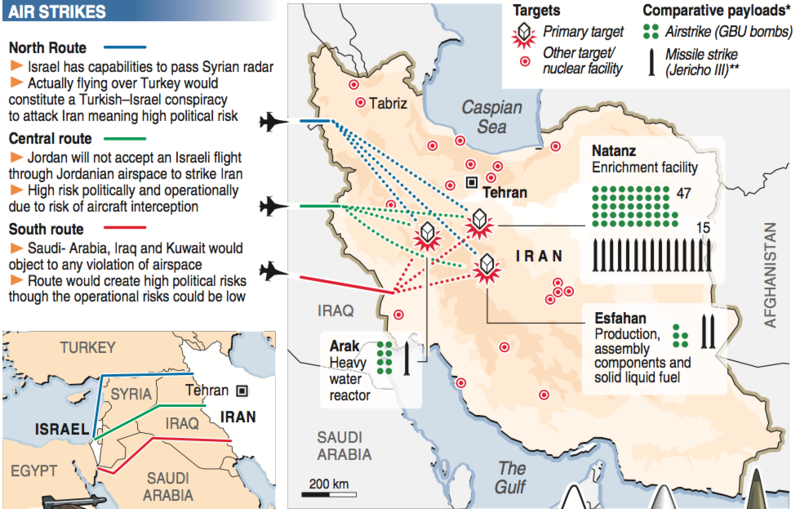 Israel is worried that Iran could build nukes to use against it; Iran may be worried that it will forever be under threat of Israeli strike until it has a nuclear deterrent. That’s called a security dilemma and it can get bad. So, first ignore everything on this map except for the light-orange overlay. That shows the area where an ethnic group called the Pashtun lives. Now pretend it’s the 1800s and you are a British colonial officer named Mortimer Durand, and it’s your job to negotiate the border between the British Indian Raj and the quasi-independent nation of Afghanistan. Do you draw the border right smack across the middle of the Pashtun areas, thus guaranteeing decades of conflict by forcing Pashtuns to be minorities in both states? If you answered «yes,» then you would have made a great British colonial officer, because that’s what happened. The «Durand Line,» marked in red, became most of the border between modern Afghanistan and Pakistan. 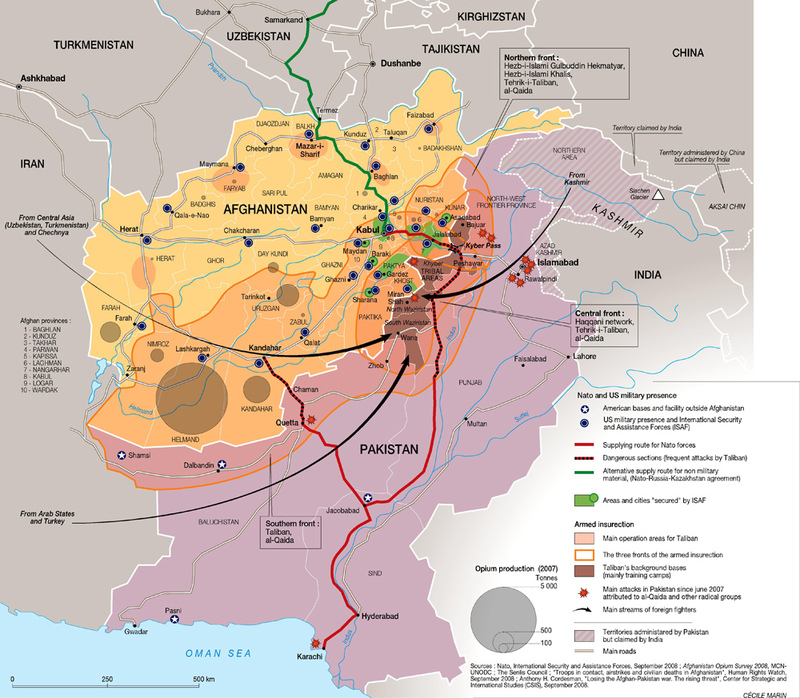 Many Pashtun now belong to or support a mostly-Pashtun extremist group called the Taliban, which wreaks havoc in both countries and has major operating bases (shown in dark orange) in the Pakistani side of the border. Thanks, Mortimer! 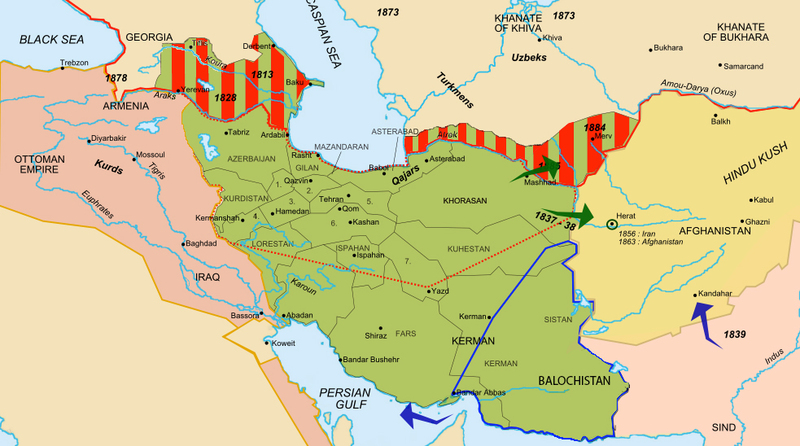 In 1979, the Soviet Union invaded Afghanistan to defend the pro-Moscow communist government from growing rebellions. The US (along with Saudi Arabia and Pakistan) funded and armed the rebels. The CIA deliberately chose to fund extremists, seeing them as better fighters. When the Soviets retreated in 1989, those rebel groups turned against one another, fighting a horrific civil war that you can see on this map: the red areas were, as of 1989, under government control. Every other color shows a rebel group’s area of control. Some of these rebels, like the Hezb-i Islami Gulbuddin, are still fighting, though most of them were defeated when the Taliban rose up and conquered the country in the 1990s. This is to underscore the degree to which Afghanistan’s current war (the war that began when the US and allies invaded in 2001, not the 1979 to 1989 war against the Soviets or the civil wars from 1989 to 2001) is and is not about ethnicity. 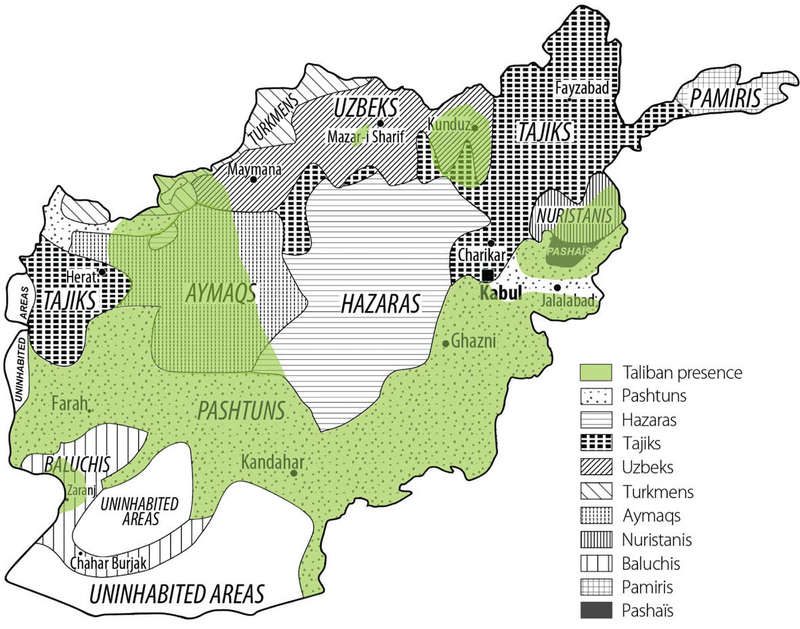 The Taliban does very broadly, but not exclusively, overlap with the Pashtuns in the south and east. That’s especially important since there are so many Pashtuns just across the border in Pakistan, where the Taliban have major bases of operation. But there are rebel groups besides the Taliban, not all of which are Pashtun. Generally, though, the north of the country is stabler and less violent than the south or east. The Afghanistan War is extremely complicated, but this map does a remarkable job of capturing the most important components: 1) the Taliban areas, in orange overlay; 2) the areas controlled by the US and allies, in depressingly tiny spots of green; 3) the major Western military bases, marked with blue dots; 4) the areas of opium production, which are a big source of Taliban funding, in brown circles, with larger circles meaning more opium; 5) the supply lines through Pakistan, in red, which Pakistan has occasionally shut down and come under frequent Taliban attack; 6) the supply line through Russia, which requires Russian approval. 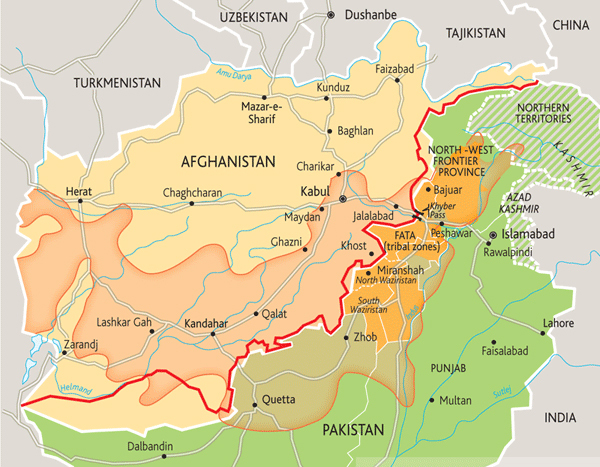 If this map does not depress you about the prospects of the Afghan War, not much will. The Arabian peninsula has a very, very long history, and the Saudi family has controlled much of it since the 1700s. But to understand how the peninsula got to be what it is today, go back about a 100 years to 1905. The Saudis at that point controlled very little, having lost their territory in a series of wars. The peninsula was divided into lots of little kingdoms and emirates. The Ottoman Empire controlled most of them, with the British Empire controlling the southernmost third or so of the peninsula — that line across the middle shows how it was divided. After World War I collapsed the Ottoman Empire, the Saudis expanded to all of the purple area marked here, as the British had promised for helping to fight the Ottomans. (This deal is dramatized in the film Lawrence of Arabia). By the early 1920s, the British effectively controlled almost all of the peninsula, which was divided into many dependencies, protectorates, and mandates. But the Saudis persisted. The Middle East produces about a third of the world’s oil and a tenth of its natural gas. (It has a third of all natural gas reserves, but they’re tougher to transport.) Much of that is exported. That makes the entire world economy pretty reliant on the continued flow of that gas and oil, which just happens to go through a region that has seen an awful lot of conflict in the last few decades. This map shows where the reserves are and how they’re transported overland; much of it also goes by sea through the Persian Gulf, a body of water that is also home to some of the largest reserves in the region and the world. The energy resources are heavily clustered in three neighboring countries that have historically hated one another: Iran, Iraq, and Saudi Arabia. The tension between those three is something that the United States, as a huge energy importer, has been deeply interested in for years: it sided against Iran during the Iran-Iraq war of the 1980s, against Iraq when it invaded Kuwait and threatened Saudi Arabia in the 1990s, again against Iraq with the 2003 invasion, and now is supporting Saudi Arabia in its rapidly worsening proxy war against Iran. The global economy depends on this narrow waterway between Iran and the Arabian Peninsula. 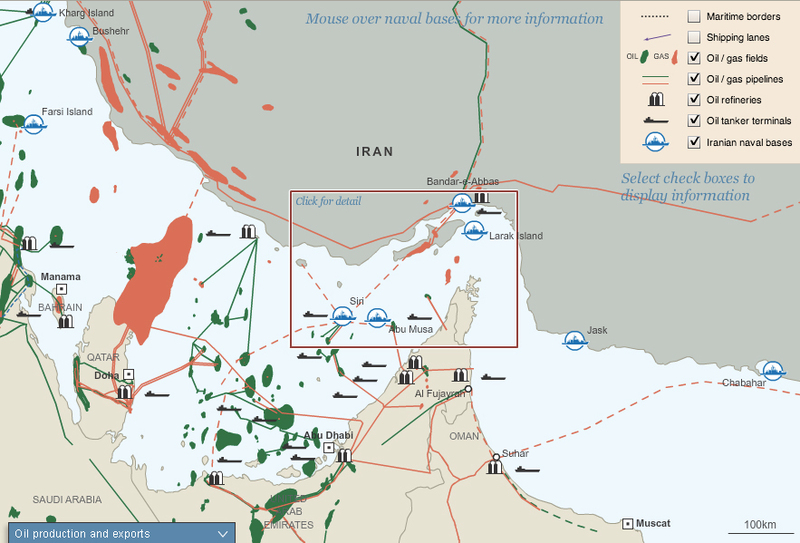 Ever since President Jimmy Carter issued the 1980 «Carter Doctrine,» which declared that the US would use military force to defend its access to Persian Gulf oil, the little Strait of Hormuz at the Gulf’s exit has been some of the most heavily militarized water on earth. The US installed a large naval force, first to protect oil exports from the brutal Iran-Iraq War of the 1980s, then to protect them from Saddam Hussein in the 1990s Gulf Wars, and now to protect them again from Iran, which has gestured toward shutting down oil should war break out against Israel or the US. As long as the world runs on fossil fuels and there is tension in the Middle East, there will be military forces in the Strait of Hormuz. The Suez Canal changed everything. When Egypt opened it in 1868, after ten years of work, the 100-mile, man-made waterway brought Europe and Asia dramatically and permanently closer. The canal’s significance to the global order was so immediately obvious that, shortly after the British conquered Egypt in the 1880s, the major world powers signed a treaty, which is still in force, declaring that the canal would forever be open to trade and warships of every nation, no matter what. 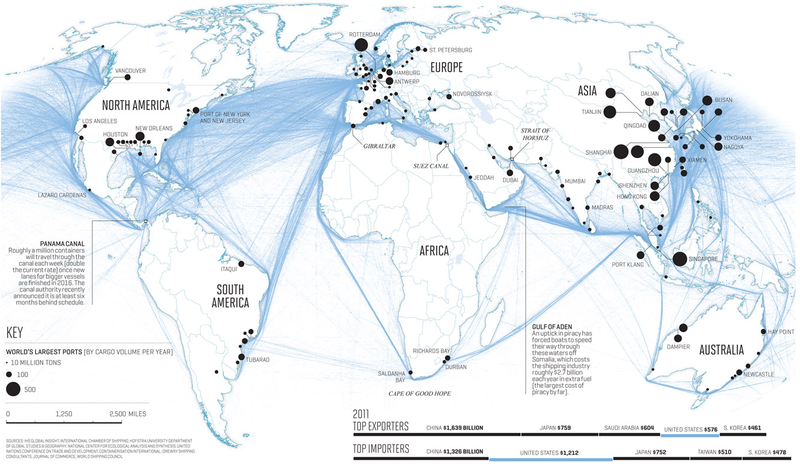 Today, about eight percent of all global trade and three percent of global energy supply goes through the canal. There are few grimmer symbols for the devastation of the Iraq War than what it did to Baghdad’s once-diverse neighborhoods. The map on the left shows the city’s religious make-up in 2005. Mixed neighborhoods, then the norm, are in yellow. 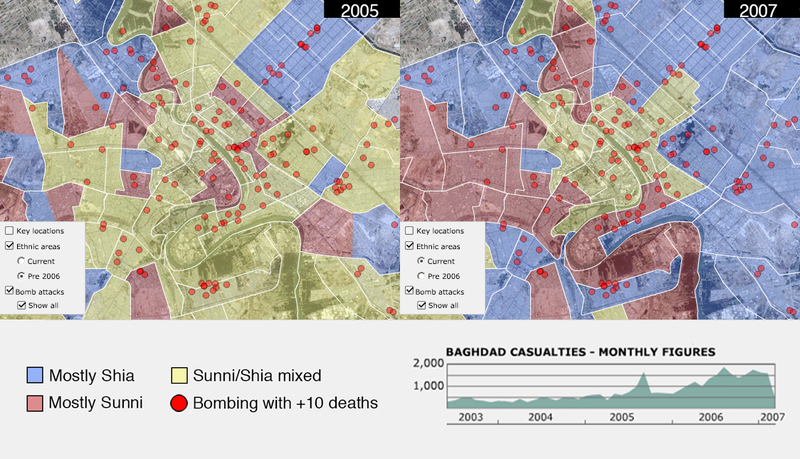 The map on right shows what it looked like by 2007, after two awful years of Sunni-Shia killing: bombings (shown with red dots), death squads, and militias. Coerced evictions and thousands of deaths effectively cleansed neighborhoods, to be mostly Shia (blue) or mostly Sunni (red). Since late 2012, the sectarian civil war has ramped back up, in Baghdad and nationwide. The ethnic group known as Kurds, who have long lived as a disadvantaged minority in several Middle Eastern countries, have been fighting for a nation of their own for a long time. This map shows where they live in green overlay, and the national borders that they have proposed on three separate occasions, all of them failed. The Kurds have fought many armed rebellions, including ongoing campaigns in Syria and Turkey, and suffered many abuses, from attempted genocides to official bans on their language and culture. Their one major victory in the last century has been in Iraq: as a result of the US-led invasion that toppled Saddam Hussein, Iraqi Kurds have autonomous self-rule in Iraq’s north. This is an old idea that gets new attention every few years, when violence between Sunnis and Shias reignites: should the arbitrary borders imposed by European powers be replaced with new borders along the region’s ever-fractious religious divide? The idea is unworkable in reality and would probably just create new problems. But, in a sense, this is already what the region looks like. 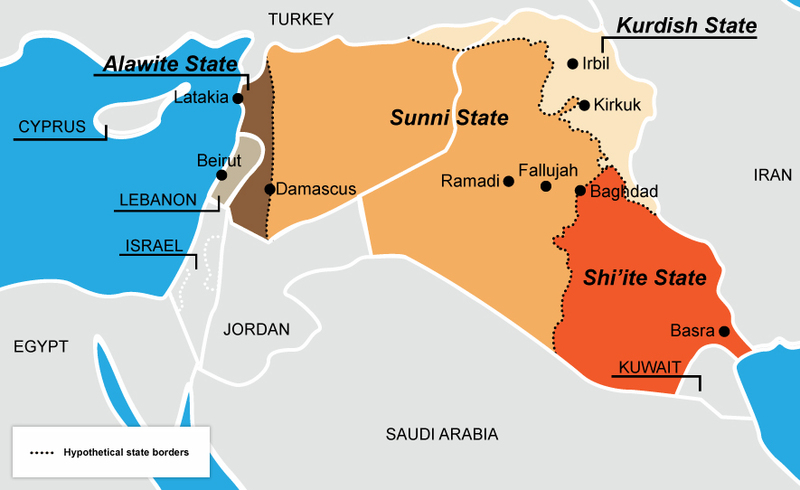 The Iraqi government controls the country’s Shia-majority east, but Sunni Islamist extremists have seized much of western Iraq and eastern Syria. The Shia-dominated Syrian government, meanwhile, mostly only controls the country’s Shia- and Christian-heavy west. 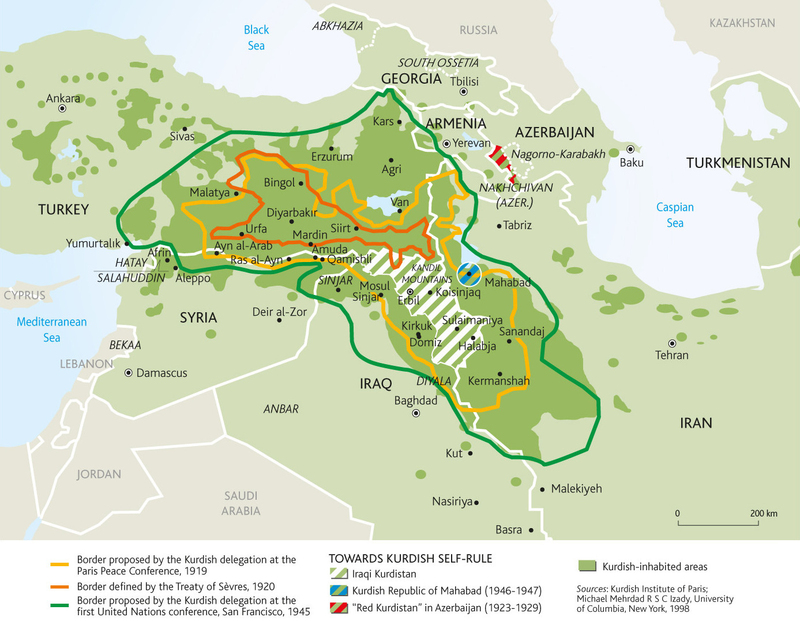 The Kurds, meanwhile, are legally autonomous in Iraq and functionally so in Syria. This map, then, is not so much just idle speculation anymore; it’s something that Iraqis and Syrians are creating themselves. Noble as the cause was, the destruction of Moammar Qaddafi’s dictatorship by a spontaneous uprising and a Western intervention has just wreaked havoc in Africa’s northern half. This map attempts to show all that came after Qaddafi’s fall; that it is so overwhelmingly complex is precisely the point. The place to center your gaze is the patterned orange overlay across Libya, Algeria, Mali, and Niger: this shows where the Tuaregs, a semi-nomadic ethnic minority group, lives. 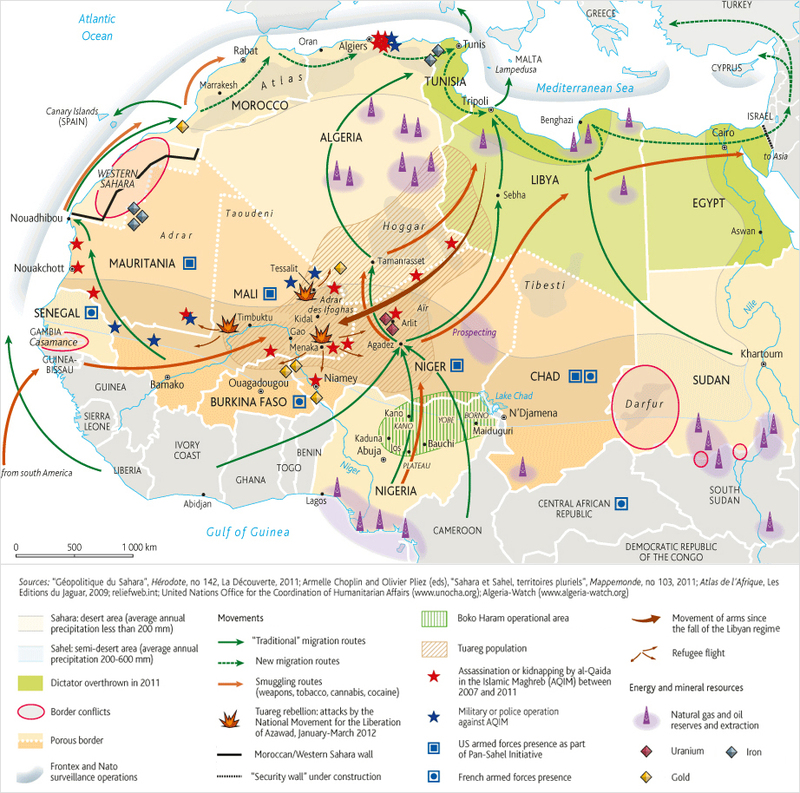 Qaddafi used Libya’s oil wealth to train, arm, and fund large numbers of Tuaregs to fight the armed uprising in 2011. When he fell, the Tuaregs took the guns back out with them to Algeria and Mali, where they took control of territory. In Mali, they led a full-fledged rebellion that, for a time, seized the country’s northern half. Al-Qaeda moved into the vacuum they left, conquering entire towns in Mali and seizing fossil fuel facilities in Algeria. Criminal enterprises have flourished in this semi-arid belt of land known as the Sahel. So have vast migration routes, of Africans looking to find work and a better life in Europe. At the same time, armed conflict is getting worse in Nigeria and Sudan, both major oil producers. Qaddafi’s fall was far from the sole cause of all of this, but it brought just the right combination of disorder, guns, and militias to make everything a lot worse. These maps are two ways of looking at a similar thing: the digitalization of the Middle East. The map on top is actually a population map: the dots represent clusters of people, but the dots are colored to show how many IP addresses there are, which basically means how many internet connections. 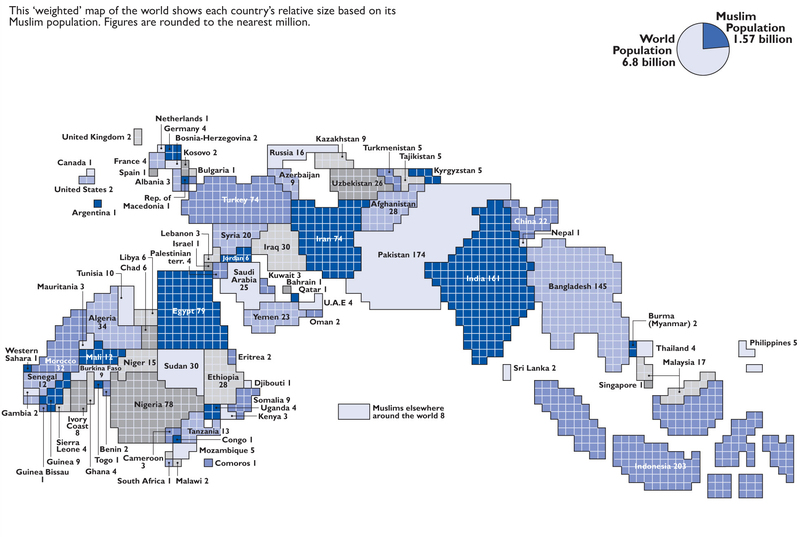 The blue areas have lots of people but few connections: these are the poorer areas, such as Yemen, Pakistan, and Syria. White and red show where there are lots of connections: rich countries like Israel and the United Arab Emirates, but also parts of Egypt and Iran and Turkey, the populations of which are increasingly wired, to tremendous political consequence. 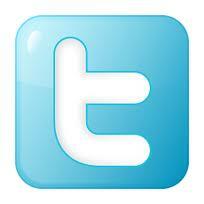 The map on the bottom shows tweets: lots of dots mean lots of tweets from that area. They’re colored by language. Notice where these two maps are different: Iran has lots of internet connections but almost no tweets; like Facebook, Twitter has been banned since the 2009 anti-government protests. Saudi Arabia, on the other hand, lights right up: its modestly sized population is remarkably wired. The significance of that became clear, for example, with the 2012 and 2013 social media-led campaigns by Saudi women to drive en masse, in protest of the country’s ban on female drivers. The consequences of internet access and lack of access will surely continue to be important, and perhaps hard to predict, for the region. I’m concluding with this map to look at the region without political borders, without demographic demarcations of religion or ethnicity, without markers of conflict or oil. Looking at the region at night, from space, lets those distinctions fall away, to see it purely by its geography and illuminated by the people who call it home. 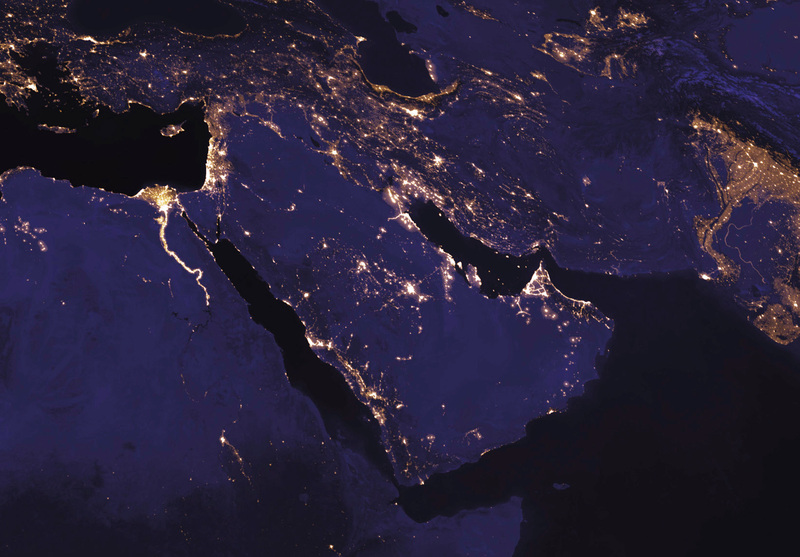 The lights trace the rivers that have been so important to the Middle East’s history, and the world’s: the Nile in Egypt, the Tigris and Euphrates that run through Iraq and Syria, the Indus in Pakistan. They also show the large, and in many cases growing, communities along the shores of the Persian Gulf, the eastern Mediterranean, and the southern end of the Caspian. It’s a beautiful view of a really beautiful part of the world. ‹ Π. Ήφαιστος, ΠΕΡΙ ΔΙΕΘΝΟΥΣ ΔΙΚΑΙΟΥ, ΑΠΟΤΡΕΠΤΙΚΗΣ ΣΤΡΑΤΗΓΙΚΗΣ ΚΑΙ ΘΟΛΩΝ ΑΝΤΙΛΗΨΕΩΝ. The silence of Greek lambs (PRAVDA. RU – 17.2.2016) ή πως μας βλέπουν οι Ρώσοι και κάθε τρίτος ενδιαφερόμενος.